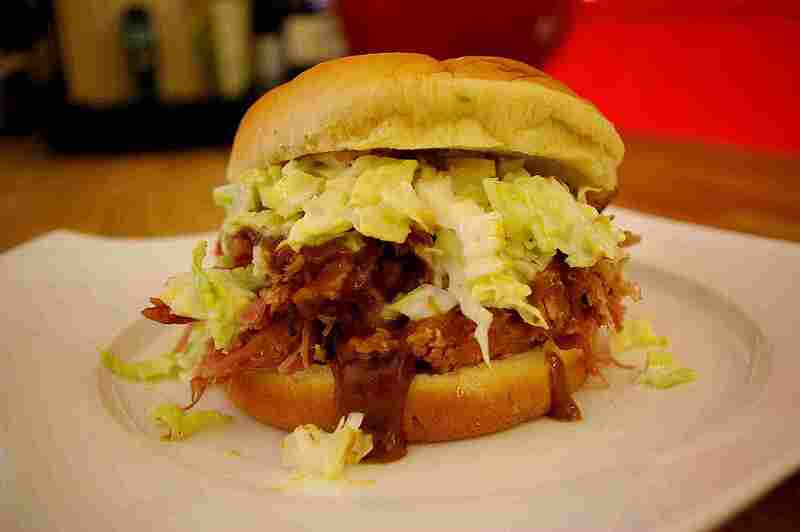 Pulled pork is probably the purest form of barbecue. This Southern barbecue tradition originated with whole hogs cooked in pits, sometimes for days, shredded by hand and served up on plain white bread. Variations abound from here with all manner of sauces, rubs, and coleslaws (typically served on top of the meat in a sandwich). Today, most pulled pork is prepared with pork shoulder roast. However you like it, these pulled pork recipes make a great meal. This is a traditional Carolina-style recipe for pulled pork including the rub and a mop (baste) that gives you a great tasting plate of barbecue. Though this really doesn't need a barbecue sauce, you can reserve some to add to the meat when you pull it. Memphis-style barbecue combines sweet, heat and savory. This recipe adapts those flavors to this great Southern barbecue pork. This basic process for pulled pork is designed to give you the best possible barbecue pork. Once you get the basics down, you can start experimenting with your own ideas. A nice southwestern style barbecue pulled pork recipe which can be eaten without the bun. This dish would be great accompanied by grilled vegetable kebabs or grilled corn. You can adjust the amount of red pepper used in this spicy pulled pork recipe to increase or reduce its spiciness. This is a delicious pulled pork recipe. You can add more or less cayenne to the sauce to adjust the heat to your liking. This recipe is your shortcut solution to Carolina pulled pork barbecue. While it lacks the authentic flavor of slow-smoked barbecue, if it's all you have to work with, then go for it. To prepare the wet mustard rub, you will need to use a mortar and pestle or spice grinder to mince the citrus peels and rosemary leaves. This rub leaves you with a tangy and succulent style pulled pork. This mildly spicy Southwestern pulled pork is infused with the wonderful flavors of cumin, chili powder, and allspice. An excellent way to enjoy breakfast​ is to use the leftover pulled pork from the night before. This pulled pork casserole incorporates Mexican cooking flavors for a mouthwatering meal.